Haha it sounds harder than it actually is but through NEF I’ve learnt two ways to tell your story when you’re pitching your business – courtesy of Adele Barlow (of Escape the City). It makes your ‘pitch’ so much less offensive (you all know what I mean) and makes the conversation that you’re about to embark on just that. A conversation. Rather than pitching your business to people you meet. Tell them a story so that you can create people who want to follow your story. Who is the hero? You can think of yourself (or rather your business/product) as a hero. Where is the conflict? What problem are you trying to solve? How does your product or service provide the resolution? Delivers the food to expats. So my story would be, Packed Munches delivers food to expats who have difficulty finding British food abroad. Hmmm, it’s good but it’s no cigar. Which is where the second method comes in. The traditional way that companies sell their product is exactly as I did above. By telling you what the service is, how we do it and why. Packed Munches (WHAT) delivers food to expats (HOW) who have difficulty finding British food abroad (WHY). So I guess the answer to the question to pitch or not to pitch is to pitch without pitching. 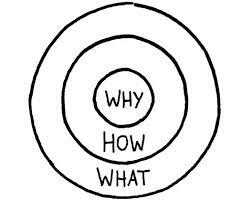 Tell your story using the Golden Circle. Living in a new country can be difficult: new culture, new language and new people. We want to encourage people to shake off the feeling of being homesick and experience the joys of being abroad. Every month we help expats to stay connected with home and reminded of the good times by delivering a taste of home to their doors. It’s like a hug in a box from home.